ASPA has put together answers to some of those questions that you might have. If your question has not been answered or you require clarification, please contact our Member Services Officer Darcy Hryn – Bird at darcy@aspasask.ca or 306-966-7392. How can I support CUPE 1975 right now? You could send CUPE 1975 a note of support. Messages should be sent to cupe1975@sasktel.net or you could consider signing CUPE’s petition at https://cupe.ca/tell-u-s-paws-our-pension which will send a message to the employer that pension provisions should be negotiated. 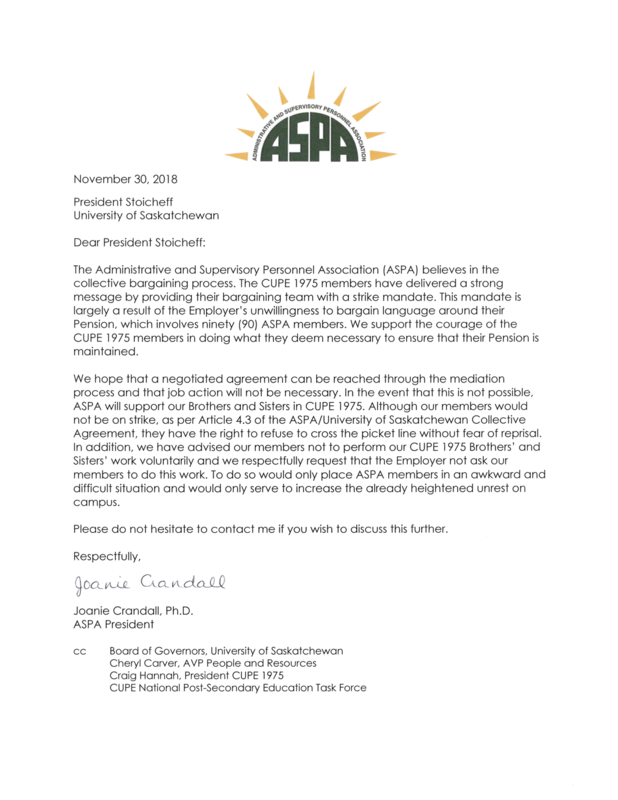 In addition, the ASPA Executive has sent a letter of support to CUPE 1975. ASPA has also sent a letter to President Stoicheff expressing our support of CUPE 1975. When can CUPE 1975 go on strike? CUPE 1975 is currently in mandated mediation that can last up to 60 days. If an agreement cannot be reached through mediation then there will be a two-week cooling off period. During the mediation and cooling off periods there is no ability for job action. After this time however, CUPE 1975 would be in a position to strike. CUPE 1975 would need to provide the employer with 48 hours’ notice prior to the commencement of any job action. There is no way to know when or if this may occur. We hope that the parties will be able to negotiate a fair and reasonable agreement during the mediation process. Can the employer lock CUPE 1975 out? Yes. A lockout could not occur however, during the mandated mediation or the two-week cooling off period that follows an unsuccessful mediation process. The employer would also have to provide the Union with a notice of 48 hours prior to the lockout commencing. Should CUPE 1975 go on strike or be locked out and put up a picket line can I cross it? Yes. ASPA members would not be on strike and therefore can continue to go into work. We would ask that you only perform work duties that were normally part of your job prior to any CUPE 1975 job action or employer lock out. Can I refuse to cross the picket line? Yes. Article 4.3 of the ASPA Collective Agreement identifies that you can refuse to cross the picket line and not face any disciplinary actions but you will also not receive any pay for this time unless of course you were working remotely from home. How can I support CUPE 1975 even if I cross the picket line to do my work? You can support them by taking some time out of your day to walk the picket line with them, find out the issues, encourage the administration to get back to the bargaining table and most importantly only do work that was part of your normal duties. What if my supervisor asks for volunteers to do work that would normally be done by staff within CUPE 1975 and not related to your normal duties or your unit. Should I do this? Ultimately, you will have to decide but ASPA supports our Brothers and Sisters in CUPE 1975 and we would ask that you not do work outside of what is normally part of your duties. Please do not volunteer to do work that would be in the scope of CUPE 1975. ASPA supports CUPE 1975 in the actions that they deem necessary. Volunteering to help out only diminishes the actions that CUPE 1975 has had to take. What if my supervisor requires me to do something that is not part of my normal duties but would have normally been done by someone from CUPE within my unit? Can I refuse to do this work? First ask your supervisor if they are requiring that you do this work or if they are asking you to do it. If they are asking then you have the ability to say no. If they are requiring you to do the duties, then perform them and contact ASPA at aspa@aspasask.ca to let us know who your supervisor is and the duties that you were required to do. Sisters diminishes the actions that they determined necessary to take. It also heightens the unrest in the workplace. ASPA supports CUPE 1975 in the actions that they deem necessary. The ability for CUPE 1975 to reach a fair and reasonable collective agreement will impact ASPA when it is our turn to negotiate with the employer next year. We need to support each other in these difficult times. I am in the CUPE 1975 pension plan. Can I switch plans now? There is no ability for you to switch plans at this point. You would have had to make this choice to move pensions when you moved from a CUPE position to ASPA. If I am in the CUPE 1975 pension plan will I have a say in what happens with it? The CUPE 1975 bargaining team is attempting to negotiate how best to maintain the plan to ensure that those individuals will have a good plan when they retire. As we understand it, one of the main stumbling blocks to not achieving a negotiated agreement to this point, is that the employer is not interested in looking at bargaining the pension provisions with CUPE 1975. Ultimately, it will be the CUPE 1975 bargaining team and the members of CUPE 1975 who will determine what the pension plan will look like moving forward. ASPA will do its best to provide our members who are in the plan with updated information. You may however wish to frequent or follow the CUPE 1975 website at: https://1975.cupe.ca/.